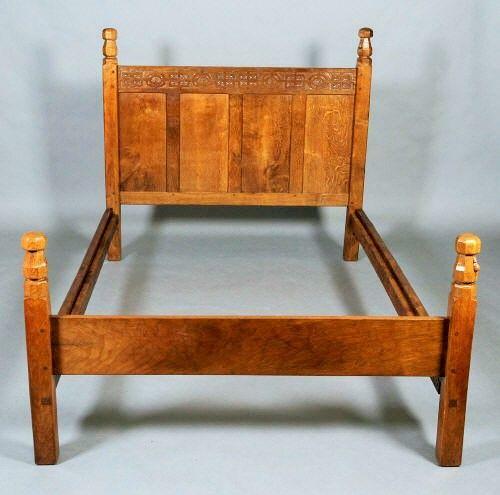 Superb and rare early period c1929 fully adzed oak double (takes a 4ft 6" wide matttress) by Robert (Mouseman) Thompson. Carved mouse to both bedhead and footboard and superb stylised carving (and date) to bedhead frieze. Most probably a one-off commissioned piece. Complete with its original oak side rails and modern slats; ready for immediate use! Approx 55" wide; overall length 7ft, height of headboard 49.5", height of footboard 31"
Additional (hopefully better!) images to follow soon.